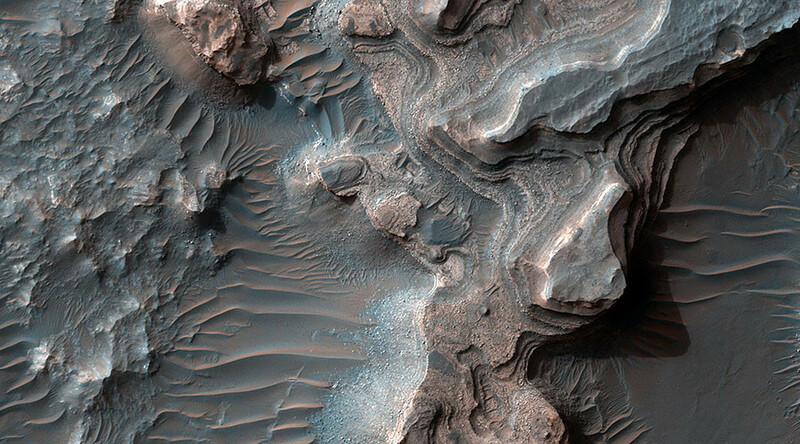 Uzboi Vallis is situated in the Margaritifer Sinus quadrangle (MC-19) region on Mars, believed to have been formed by water that once existed on the planet. The dramatic layers of rust-hued rock likely formed when the valley’s drainage was blocked by a large impact that hollowed out the planet’s Holden Crater. Over time, the valley’s water level rose high enough to flow out over the top of the crater and drained the lake, eroding the layered deposits in the process. However, some layers were strong enough to withstand the erosion and remain intact today. The magnificent detail of these layers was captured in stunning high definition by powerful NASA instruments. The variation across the valley floor suggests that the clays have, in fact, been washed in from surrounding areas. Earlier this month, the European Space Agency also found evidence of a huge flood on the red planet some 3 billion years ago, the remnants of which were captured by the agency’s high-definition camera onboard the Mars Express.